Bulnex” AD was established in June 2001 with subject of activity – offering of hardware solutions. At a later stage the company focused on the post-sale service of its network of clients. Bulnex has specialized in hardware maintenance and delivers such service on a subscription basis to companies of any class. The highly-qualified team of specialists offers 24- hour licensed technical assistance through a continuous telephone support, “hot line” type. Bulnex supports more than 20 000 actually working devices in the following areas: trade, banking, distribution, finance and human resources. In 2008 we started to develop a dealer network in 26 municipal cities – aiming to encompass fully the prospective clients and to gain new markets. We are continuing our fruitful cooperation with the company’s partners from all over the world – manufacturers of highly technological devices for the sphere of trade and production. Bulnex is an exclusive representative of METTLER TOLEDO – Germany, as well as of other world business leaders such as S.A.M. Kuchler and THALES E-transactions. The company specializes in the maintenance of their product range, as well as in the certified service of the equipment of well-established manufacturers such as Diebold Nixdorf, DataLogic, Honeywell, PSC, SATO, DLoG, etc. Bulnex guarantees the best hardware solutions for its clients as an official representative for Bulgaria and a certified business partner. From the day of its establishment, June 2001, to the present moment the company has undergone continuous development in accordance with the dynamics of the technological, economic and client-oriented market. In this connection its network of clients is constantly developing and becomes richer with: trade chains /some of them are: Hit Supermarkets, Karrefour, PLUS, Lidl, Piccadilly, Fantastico, Metro Cash and Carry, SBA/, retail and utility companies /E-On Bulgaria and BTC, pharmacy centres/, petrol stations, industrial and logistic companies, etc. Already positioned on the market of highly technological products `Bulnex` AD prepares individual projects, installs hardware and software, provides warranty and post-warranty maintenance and information service, supplies its clients with consumables and resolves current issues connected with the changes in the business environment. The company takes part in the creation of overall projects for the management of shops, industrial warehouses, production facilities, etc. The correct and maximum efficient exploitation and maintenance of the hardware equipment and the software is achieved by training the personnel, which Bulnex also offers, and thus guarantees reliability when working with the equipment. In cooperation with, self-service terminals have been successfully developed and installed in different trade areas. Bulnex has launched an On-line store. Expanded its sales department up to 10 specialists. The city of Lovech was added to the service locations. Bulnex finished joint project with SIS Technologies and Wincor Nixdorf - the new fiscal printer BULPRINT. Bulnex was nominated and selected as the winner in the category "The biggest deal for 2014", in Eastern Europe. One of the biggest Bulgarian companies - Overgas and Sting became our clients. Bulnex became a Platinum partner of the US Comapany Honeywell. Bulnex successfully finalize a project to equip courrier company Europat with mobile terminals and fiscal printers. Bulnex became an official distributor and authorized service of Fujitsu. 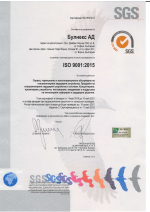 The company passed certification for Quality Management according to ISO 9001: 2008. According to Ordinance 18 Bulnex successfully meet the requirements with the introduction of tax terminals to fiscal devices. The company changed its headquarters in Sofia with a new, larger and more functional office. The new address is: MEGAPARK Business Park, bul. Tsarigradsko Shosse 115 g, 6th floor. It was successfully approved and certified by the Bulgarian Metrology Institute - the new fiscal device Wincor Nixdorf TH230. Bulnex sets up a distribution network all over the country. The company diversifies the portfolio of offered services with the new service of installing systems of access control and video control. The company changes its central offices in Sofia and Varna with bigger and more functional ones. The office in Sofia moves to Antim Tower, whereas the office in Varna moves to the building of Business Park Varna. Alongside with its continuing fruitful cooperation with its clients Bulnex enters into contracts with new key clients e.g. E-ON, CBA, etc. Three new offices in the country are opened. The coverage allows for potential to react within two hours independently in which point of the country the maintained site is. The world innovator and leader Intermec certifies Bulnex as Honours Premier Partner. A contract for hardware and software maintenance of KIOSK terminals in the whole country is concluded. The company begins installation of the fiscal system for metering liquid fuels NEXUS 1.00. The successful implementation in over 180 petrol stations proves the high quality of the system. Bulnex creates a wide network of offices all over the country and turns into one of the most powerful service companies in Bulgaria / maintains more than 7 000 actually working devices. The first in their kind for Bulgaria KIOSK terminals are successfully integrated. More that one hundred sites use this solution. The company officially receives the status of a partner of Mettler Toledo – a leading manufacturer of electronic scales – and after the certification begins the first installations of the company`s products in Bulgaria. There begins a large scale campaign for installation of EFT terminals for `Transcard` AD in trade outlets all over the country. Bulnex begins to service a large range of barcode devices and hand held terminals. The department of hardware maintenance of `SIS Technology` OOD differentiates as a separate company – `Bulnex Engineering` OOD. 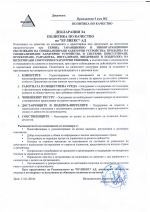 Establishment of the company `SIS Technology` OOD. The highly technological business which the company is involved in makes it necessary to search and invest in the asset of motivated and competent specialists who wish to work in the field of their qualification. We encourage the continuous development of knowledge and skills and we offer excellent labour conditions and motivating remuneration.